This clearly marked 24-Oz container is specially designed so you add just the right amount of water with your concentrated ADVANAGE 20X cleaner. Heavy-duty sprayer included. Each bottle pre-marked for 20:1, 10:1, 5:1, 2:1 and 1:1 dilutions. 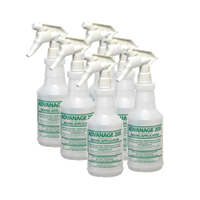 An indispensable accompaniment for your concentrated ADVANAGE 20X Cleaner. Works with all 20X products.